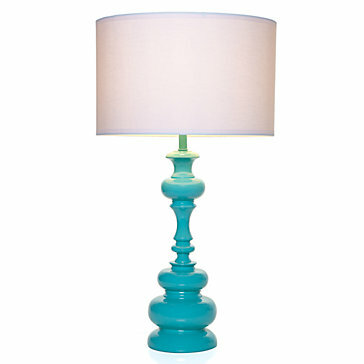 During a recent trip to the Goodwill, I couldn't help but try to replicate one of these Teal lamps seen here at Z Gallerie and Target. Here's what I made for $14.00! It looked like this when I brought it home from the Goodwill. It was black and I think made of wood. All the lamps are tested before they are sold, which I made sure to ask about when I was there. I loved that it had all the curved details somehow I was even fond of the gold cord. I gave it a good sanding with 120 grit sand paper to really rough it up. Then I wiped it down and used Valspar's spray primer. I let it dry for 24 hours. Then I applied Rust-Oleum Painter's touch Ultra Cover in Lagoon. I still had quite a bit of this left over from my mirror project. It's always nice to have two items painted the same in a room, to tie things together a bit. I found this lamp shade a target that is white with a wavy pattern for $10.99. I love adding texture to an otherwise boring white lamp shade. It's also nice to add texture when you're sticking to a few colors in your room. Joe finally has a table lamp next to his side of the bed. Isn't he cute? I love the way the lamp compliments the yellow in the table and the gray headboard. For for comparison, the target lamp pictured above was $24.99 and I would have needed the larger lamp shade which was $19.99. So instead of paying $45 for a new lamp, I made one for $14.00 Yay!